By now, it’s become a horror movie cliche that just when you think the monster or whatever evil force that has been running amuck is finally dead, it springs up and attacks again. A more fun version of that can be found in the way we celebrate Halloween. Since most of the parties or bar festivities took place over last weekend, it seems like the holiday has already returned to its crypt for another year. Kids still have trick or treating to look forward to, but is there anything left for adults? There’s another cover band event taking place at Martyrs’ Pub on Lincoln Avenue tonight. 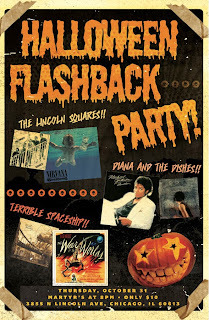 It’s titled Halloween Flashback Party, and features The Lincoln Squares performing Nirvana’s groundbreaking Nevermind CD; and Diana And The Dishes performing Michael Jackson’s Thriller. In addition, Terrible Spaceship will be performing their Invaders 1938 CD, which was inspired by the War Of The Worlds broadcast by Orson Welles and is described as “a terrifying story you can dance to.” Terrible Spaceship will also perform its second CD, Zontar, the Thing from Venus. Guests are invited to come in costumes. They’ll be celebrating Halloween Madness tonight with a tribute band showcase at Durty Nellie’s in Palatine. The lineup is Farraday as Blink 182; Belmont Cross as Paramore, American Autumn as Fall Out Boy; and Another Black Hour as Metallica. $10 admission, $7 if in costume. Soundtrack Serenade will be performing the soundtrack from Saturday Night Fever at Reggie’s Music Joint on State Street tonight. The musicians involved include Neal Alger, Charlie Short, Phil Angotti, Holly Senchak, Dan Ingenthron, Aaron McEvers, Ben Bell Bern, and Chris Anderson. Keep in mind wearing a white leisure suit would be scarier than any costume. The show starts at 9:00PM. Also at Reggie’s tonight, Select Zombie Musicians will be performing Michael Jackson’s Thriller album. Photo Of Metropollly as Liz Phair By Alex Bruscino. “The Wilburys are here in their astral bodies,” one of The Shams quipped shortly after the band had started its tribute to The Traveling Wilburys at Martyrs’ Pub last Friday night. In costumes to look like George Harrison, Tom Petty, Bob Dylan, etc, the band members were part of the annual Halloweekend Tribute Band event. It was disappointing to find that for some reason, Halloweekend was cut down to one night this year, but at least the truncated lineup was an imaginative one. 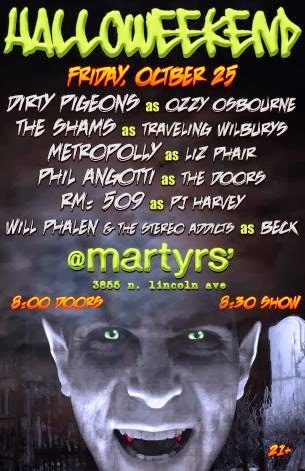 In addition, to The Shams, who opened with a spirited take on “Heading For The Light,” Halloweekend offered Will Phalen and The Stereo Addicts as Beck; Rm:509 as PJ Harvey; Phil Angotti as The Doors; Metropolly as Liz Phair; and The Dirty Pigeons as Ozzie Osbourne. I hadn’t seen Will Phalen and The Stereo Addicts before, but their short set of Beck material was impressive enough to put this band on any rock fan’s radar. As Phalen rapped through “Loser,” The Stereo Addicts created a tight groove behind him. “Where It’s At,” with Phalen manning the megaphone, was another highlight. Rm:509 fielded some familiar players in its tribute to PJ Harvey. I’ve only seen Ripley Cain in singer-songwriter mode, but she adapted well to her role as this band’s front woman. She wasn’t the only one singing lead though. Vocalist-guitarist Yvonne Doll, who also fronts The Locals, and drummer Joanna Vassilatos also took turns; and all three had strong voices. Christy Nunes, another member of The Locals, played bass in her patented head-bobbing style. Rm:509’s hard-charging performance on songs like “Down By The Water” and “Rid Of Me” was markedly different from the more subtle way Tuffy UK interpreted the eccentric English singer at last year’s Halloweekend, but both approaches were valid. Singer-guitarist Phil Angotti’s between-song patter as Jim Morrison seemed a bit cartoonish during his set as The Doors, but that could have been what he wanted for a Halloween gig. Vocally, he was on the mark, and the musicians he chose to back him were first rate. They played an extended version of “Light My Fire,” plus “Roadhouse Blues,” “L.A. Woman,” “Love Me Two Times,” and “Break On Through (To The Other Side)”. The Dirty Pigeons were on hand to bring the event to a head-banging finish as Ozzie Osbourne, but time and travel restraints kept me from staying for them. All in all, this was another entertaining edition of the annual fest, but here’s hoping Halloweekend reverts back to its customary two-day format in 2014. By the way, if any of the participants are wondering who to cover next year, they can check out my October 2nd post for some suggestions. Ms. Senchak was kind enough to comment favorably on my idea that she join forces with The Webstirs to cover The Bangles. Tomorrow: It’s not too late to catch more Halloween Tribute Band shows. 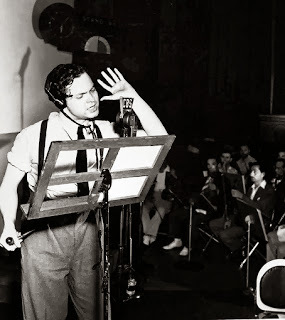 “Some day, this will be on a Phil Angotti CD!” Orson Welles performing War Of The Worlds. Following a tradition that began on Broken Hearted Toy in October of 2009, here’s a profile of a song that’s well-suited for the Halloween season. For more Halloween songs, check the month of October for each year in the BHT archives. “I See Spaceships” might be the only rock song that simultaneously evokes The Byrds and The Who while spinning a tale of intergalactic visitors who love to party. Amazingly, this whirlwind of vintage rock from Phil Angotti’s recent Life And Rhymes CD was conjured by just three musicians: Angotti on guitars; Casey McDonough on bass; and Brad Elvis on drums. If you’re looking to create a Halloween playlist, you might want to sandwich this Roger McGuinn/Keith Moon homage between the lighthearted “Mr. Spaceman” by The Byrds and the more ominous “They Are Among Us” by The Redwalls. “I’ll tell you my story but you won’t believe me,” Angotti predicts as the song kicks off. He goes on to describe how the little green men who crash-landed their saucer in his garden are now driving his car, and staying up late to party. Angotti, a 1960s fanatic, specifies that these Martians are listening to LPs (as opposed to iPods) and watching movies. They’re also often intoxicated, which might explain why their calls for help to their planet have gone unanswered. Maybe they keep dialing the wrong number. With all the rowdy behavior going on, it’s tempting to think Angotti’s homeowner is near-sighted and is really watching the neighborhood teenagers. Whoever they are, this guy isn’t about to do a Clint Eastwood and tell them to get off his lawn. “I hope that they stay here, at least until Sunday,” Angotti sings. “I See Spaceships” has a rousing instrumental coda featuring Angotti, McDonough, and Brad Elvis, with a snippet of Orson Welles from his notorious War Of The Worlds radio broadcast layered on top. Imitation Is The Sincerest Way To Rock Out - Extended Version In Blue Ink! I’ve written a lot about International Pop Overthrow - Chicago in the past few years, but my expertise with this annual festival is a drop in the bucket compared to what Mike Cohen and Jeff Janulis know about it. As the founding members of The Abbeys, they’ve performed at every IPO - Chicago festival since it started in 2001. The Abbeys have created a four-act line-up called Chicago Pop Revue for this Saturday night that borrows a page from International Pop Overthrow CEO/Founder David Bash’s playbook. 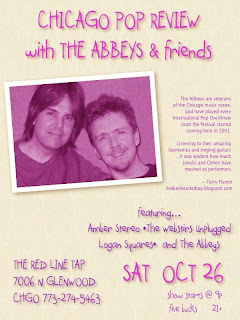 And like recent IPO - Chicago gigs, it will be held at the Red Line Tap. Also like International Pop Overthrow (which Bash brings to various cities in the U.S., Canada, and England), The Abbeys have branched out a bit from their power pop base in choosing participants. Amber Stereo leans more toward punk, and claims Lucky Boys Confusion and Streetlight Manifesto as influences. Judging from their Facebook page, these guys approach rock with a sense of humor. 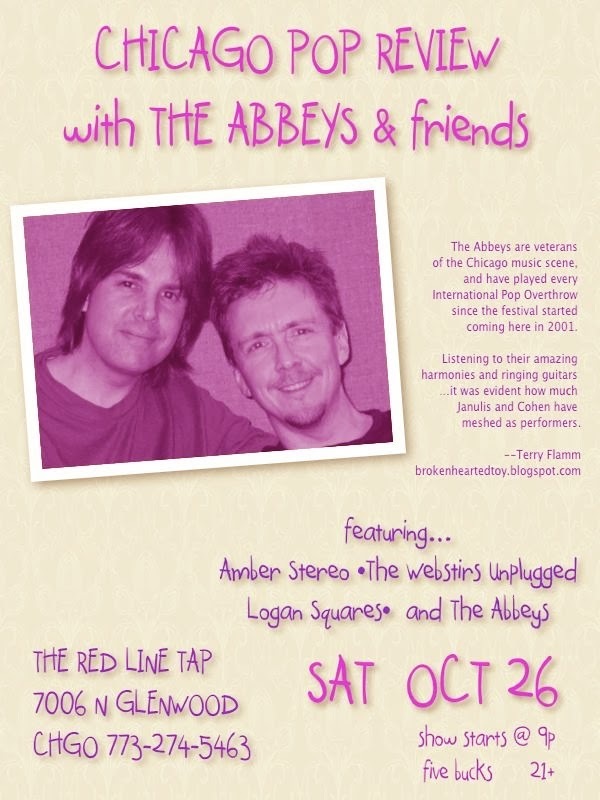 The Logan Squares played their first IPO - Chicago gig this past April. Their guitar-driven set recalled R.E.M, and The Logan Squares broke free with frequent spirited instrumental passages, while never coming across as a self-indulgent. “Logan Squares are new friends from [this] past IPO.” Cohen noted. The Webstirs have mastered the art of eccentric pop music (not many bands have songs like “Maurice Klybatzia” in their repertoire) and are IPO - Chicago veterans. Band members Preston Pisellini and Mark Winkler will be performing an acoustic set as part of Chicago Pop Revue tomorrow night that will hopefully include catchy and clever songs from CDs like Smirk. This will be the first time in a few years, that I won’t be seeing The Webstirs doing a Halloween tribute band show, but maybe Pisellini and Winkler can do a few copy tunes. The Abbeys are a highly polished and fun band. They’ll be selling copies of their new Please File Under: Twang CD (see September 23rd in Archives for review) for $10, or two for $15. If this initial Chicago Pop Revue goes over well, the question arises as to whether The Abbeys would consider this an ongoing venture. Despite Chicago Pop Revue being held on the last Saturday in October, it’s not a Halloween-themed event as far as I know. But if you listen carefully, you’ll detect the spirit of David Bash. Note: International Pop Overthrow has three more stops on its 2013 tour: New York (November 13-17); Boston (November 20-23); and Toronto (November 27-30). I haven’t been able to find anything recently online about this, but according to a post a while back on the Chicago Cultural Center website, there’s an official Opening Reception there tonight for Shutter To Think: The Rock And Roll Lens Of Paul Natkin from 5:30 to 7:30 PM. Admission is free and open to the public. It might be worth dropping by if you’re in the downtown area in case it’s still on. Foundlings Theatre Company is presenting a Psycho Halloween Party tonight to help raise funds for its upcoming production of Shakespeare’s Twelfth Night. There will be a keg, jello shots, and a costume party. Admission is $5. There’s just a single night for this year’s installment of the Halloweekend tribute band celebration, and it will be this evening at Martyrs’ on Lincoln Avenue. The scheduled acts are Will Phalen and The Stereo Addicts as Beck; Rm:509 as PJ Harvey; Phil Angotti as The Doors; Metropolly as Liz Phair; The Shams as The Traveling Wilburys; and The Dirty Pigeons as Ozzie Osbourne. The show starts at 8:40 PM; admission is $10 in advance; $12 at the door. Zombies will also be on the menu (or will have people on their menu) when Elgin holds its annual Nightmare On Chicago Street tomorrow night. Lots of Elgin’s citizens get involved with this Halloween celebration, including artist Dave Metzger, who made a few appearances in my Manchester Gallery series for the online show Sunday Morning Coffee With Jeff. CWJ host/producer Jeff Kelley has filmed numerous bits for the Nightmare On Chicago Street project, and I’ve been honored to act in a few of them. And now onto non-Halloween events going on this weekend. It’s not scary, but sad. Dot Dot Dot will perform its swan song tomorrow night at the H.O.M.E. Bar in Arlington Heights. Even though fans can’t talk the band out of quiting, at least there will be a consolation gift. Each person who buys a ticket to this final gig will receive a link to download Dot Dot Dot’s soon to be released five-song EP, Et Cetera. See the official Dot Dot Dot website for details. The Melismatics will headline a four-act showcase tomorrow night at Reggies. I just submitted my review of the band’s new Rising Tide CD to the Illinois Entertainer, so hopefully it will run in the November issue. Also on the bill at Reggie’s are The Handcuffs, The Rebel Sect, and Vanarays. Check out Reggie’s website, which has a profile on each band, along with audio clips. Brendan Benson and several of his musical friends will be doing a benefit for The David Lynch Foundation and Lightning 100 on December 18th at the Ryman Auditorium in Nashville, Tennessee. 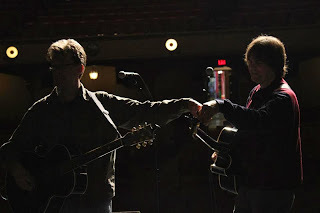 Benson’s guests include Eric Burdon from The Animals, Jon Auer an Ken Stringfellow from The Posies, his band mate from The Raconteurs, Jack White, Adriel Denae, and Cory Chisel. The Howlin’ Brothers will also join in, after doing the opening set. Tickets for Brendan Benson And Friends are $27 in advance, $30 at the door. Proceeds will go to veterans and at-risk children in the Nashville area. Poster (with some familiar copy) from The Abbeys Facebook page. I’ve written a lot about International Pop Overthrow - Chicago in the past few years, but my expertise with this annual festival is a drop in the bucket compared to what Mike Cohen and Jeff Janulis know about it. As founding members of The Abbeys, they’ve performed at every IPO - Chicago since the festival started coming to Chicago in 2001. They’ve put together a four-act line-up called Chicago Pop Revue for The Red Line Tap this Saturday night that borrows a page from International Pop Overthrow CEO/Founder David Bash’s playbook. Like International Pop Overthrow (which Bash brings to various cities in the U.S., Canada, and England), The Abbeys have branched out a bit from their power pop base in choosing participants. Amber Stereo leans more toward punk, and claims Lucky Boys Confusion and Streetlight Manifesto as influences. I haven’t seen Amber Stereo, but judging from their Facebook page, these guys approach rock with a sense of humor. The Logan Squares played their first IPO - Chicago gig this past April. Their guitar-driven set recalled R.E.M, and The Logan Squares broke free with frequent spirited instrumental passages, while never coming across as a self-indulgent. The Webstirs have mastered the art of eccentric pop music (not many bands have songs like “Maurice Klybatzia” in their repertoire) and are IPO - Chicago veterans. Band members Preston Pisellini and Mark Winkler will be performing an acoustic set as part of Chicago Pop Revue tomorrow night that will hopefully include catchy and clever songs from CDs like Smirk. This will be the first time in a few years, that I won't be seeing The Webstirs doing a Halloween tribute band show, but maybe Pisellini and Winkler can do a few copy tunes. 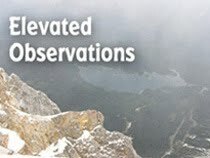 You can find my views on The Abbeys by clicking on the poster at the top of this blog (yes, Review should be Revue) and they are a highly polished and fun band. The Abbeys will be selling copies of their new Please File Under: Twang CD (see September 23rd in Archives for review) for $10, or two for $15. Despite Chicago Pop Revue being held on the last Saturday in October, it’s not a Halloween-themed event as far as I know. But if you listen carefully, you’ll detect the spirit of David Bash. You won’t often find me at book-signing events, sipping wine while listening to authors explaining the inspiration behind their work. But I’ve been to three in the past few days. 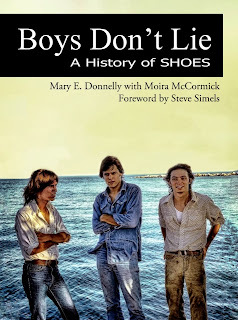 As posted here on Monday, Mary E. Donnelly and Moira McCormick were at The Book Cellar last Saturday to discuss Boys Don’t Lie: A History Of Shoes. Band members Jeff Murphy, John Murphy, and Gary Klebe were also on hand, to take questions from the audience. On Monday night, I took part in my writing group’s Four Minutes Of Fame: A Stand-up Literary Event at the Tokio Pub in Schaumburg. Eleven writers each got a turn to read their work to an audience. (See last Thursday’s post for a preview.) The presentations ranged from children’s books to adult novels, and, modesty aside, we all did well. The event was organized by Kym Brunner, Cherie Colyer, and Katie Sparks, and they also served as welcoming and supportive hosts. Brunner, in particular, was fun and informative as she introduced the participants and asked them to explain a bit about themselves and their books. I read from Finding Manchester, a comedy/suspense novel based on Chicago’s alternative music scene, circa the mid-1980s. It was fun watching my fellow group members, Brunner, Colyer, Sparks, Veronica Rundell, Mike Kelley, and Susan Kaye Quinn read to the appreciative audience. Plus, I encountered the talented writers, Lori Degman, Patricia Kummer, Allan Woodrow, and Jennifer Wagh for the first time. My only (slight) disappointment was that I was a bit too anxious during my reading. I’ll work on that for the next event. Last night, famous designer John Varvatos was at Nordstrom on Michigan Avenue to promote his foray into the rock and roll literary world. The multitude of photographs in his hardcover book, Rock In Fashion, underscore the theory that clothing and hairstyle play an essential role in the marketing of pop stars. Mick Rock took the iconic shot of Syd Barrett on the cover, and other renowned photographers, such as Bob Gruen and Lynn Goldsmith are represented as well. Like Donnelly and McCormick at The Book Cellar, Varvatos brought some rock and roll firepower with him. Mick Rock was on hand, along with guitarist-vocalist Billy Gibbons and bassist-vocalist Dusty Hill from ZZ Top. The reception on the second floor of Nordstrom leaned more toward people in designer threads than t-shirts or blue jeans, although a steady flow of classic rock was coming through the speakers. I spotted a sharp-dressed man in a black suit and a scarf that apparently was so exquisite a woman passing by asked to fondle it. There were also huge TVs showing vintage clips from the 1960s and photo montages, as servers circulated with trays of drinks or hors d’ oeuvres. The event started at 6:00 PM but Varvatos made a fashionably late arrival around 6:30. He introduced Rock, pointing out that the photographer’s work had been used on a number of album covers. When Gibbons and Hill appeared, it was like they had stepped out of ZZ Top’s “Legs” video. 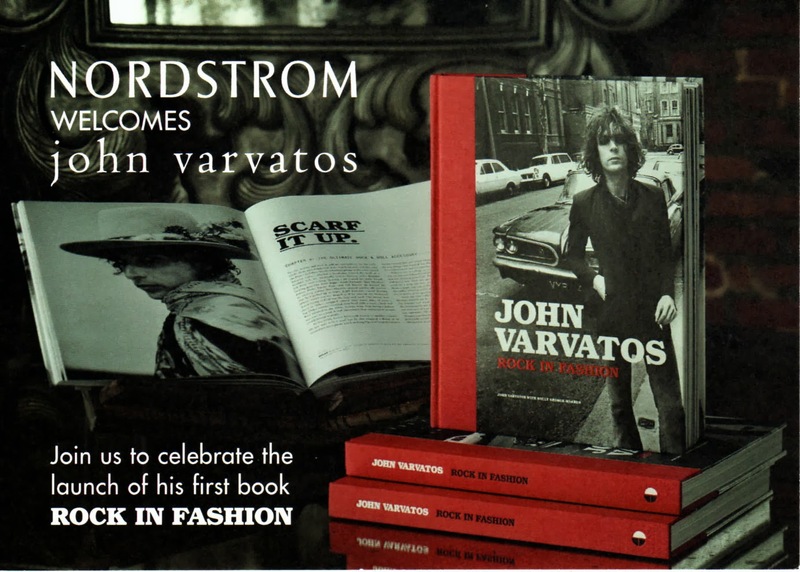 Varvatos talked about what he termed the “incestuous” relationship between rock and fashion, and how hard it was to choose one photo from his personally curated collection to be on the cover of the book. And the photographs are amazing; candid shots of musicians like The Ramones, U2, The Rolling Stones, and Bob Dylan. I was particularly taken with a vintage black and white shot of a positively impish-looking Paul McCartney. NOTE: Looking for another rock and roll photography event? There will be an official Opening Reception at the Chicago Cultural Center for Shutter To Think: The Rock And Roll Lens Of Paul Natkin this Friday, October 25th, from 5:30 to 7:30 PM. Admission is free and open to the public. There’s no mention of ghosts, witches, or zombies in “Voodoo Child (Slight Return),” but after a few moments of chicken scratch guitar and stomping, all hell breaks loose. 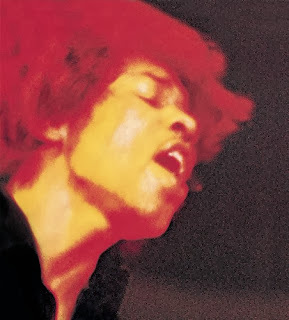 I haven’t seen that new movie Gravity, but from the reviews I’ve read, the scenes of astronauts careening through space are probably similar to the sensation Hendrix creates on “Voodoo Child (Slight Return).” He cranks his guitar at full volume and then lets it spiral off into the distance. It’s easy to imagine debris flying all around you. Note: Here’s Monday’s post on a Sunday night. A few minutes before she and Mary E. Donnelly started their book reading and signing event at The Book Cellar on Lincoln Avenue this past Saturday night, Moira McCormick overheard two customers talking about the song playing on the store’s overhead system. Hearing the guys wonder if it was by Shoes, McCormick quickly spoke up; telling them it indeed was Shoes and that the band was on the premises. Donnelly and McCormick had come to Chicago to promote their book, Boys Don’t Lie: A History Of Shoes, with Jeff Murphy, John Murphy, and Gary Klebe helping out. I had read about the band members coming, but assumed they would just be providing moral support. But after Donnelly and McCormick had taken turns discussing and reading from Boys Don’t Lie, the Murphy brothers and Klebe moved front and center to take questions from the audience. The results were enlightening and entertaining. At the start of the event Donnelly, a founding writer for the PowerPop blog, revealed that she discovered Shoes via her older brother when she was 12 years old. In her later years, a correspondence with Jeff Murphy blossomed into an opportunity to write a book about the band. McCormick, whose impressive journalistic resume includes writing for the Illinois Entertainer, along with several other publications, was brought in to help out. At The Book Cellar, Donnelly read a segment from Boys Don’t Lie about the time Shoes tried unsuccessfully to get their label Elektra to bankroll some rock videos in light of an urgent request from MTV. McCormick read an account of Shoes exploring an offer from Kiss member Gene Simmons to record for his new label. When the Murphy brothers and Klebe sat down to take questions, they were personable and honest in their responses. All three seemed to agree that the key to being able to stay together for almost 40 years despite the lack of any big-time success, was the respect and admiration they have for each other. Of course, it doesn’t hurt that all three members have a knack for writing memorable pop tunes, and they create gorgeous harmonies. After the presentation, Donnelly and McCormick joined the members of Shoes in signing copies of Boys Don’t Lie: A History Of Shoes, and seemed to be doing a brisk business. Photo from The Zombies Facebook post. I posted a few bits for Slumgullion earlier today, but here’s a much bigger helping. See These Eyes So Green. Cat enthusiasts (and I see plenty on Facebook, especially among musicians) might want to drop by the Internet Cat Video Festival that’s being held at the Irish Heritage Center on Chicago’s northwest side tomorrow. The festival features some of the more popular cat clips from the Internet. The first screening is at noon. It’s The Time To Honor The Zombies. The Rock And Roll Hall Of Fame has announced 16 nominees to be inducted in 2014. A serious case could be made for several of these acts to make the final cut. For example: Nirvana didn’t invent grunge but they brought it to the world’s attention; ditto for Yes and prog rock; NWA pioneered a harder, more confrontational breed of urban contemporary music; The Paul Butterfield Blues Band fused the bond between blues and rock; Linda Ronstadt’s voice helped define a decade; Deep Purple helped usher in heavy metal, and Jon Lord’s distinctive keyboards playing remains highly influential; and The Replacements’ unbridled approach inspired countless bands that followed after them. But if I have to pick a favorite—and that’s what I’ve done for the past few years—I’m going with The Zombies. They were one of the British Invasion’s more experimental bands with hits like “Tell Her No,” “She’s Not There,” and “Time Of The Season” that haven’t lost a bit of their allure over the decades. 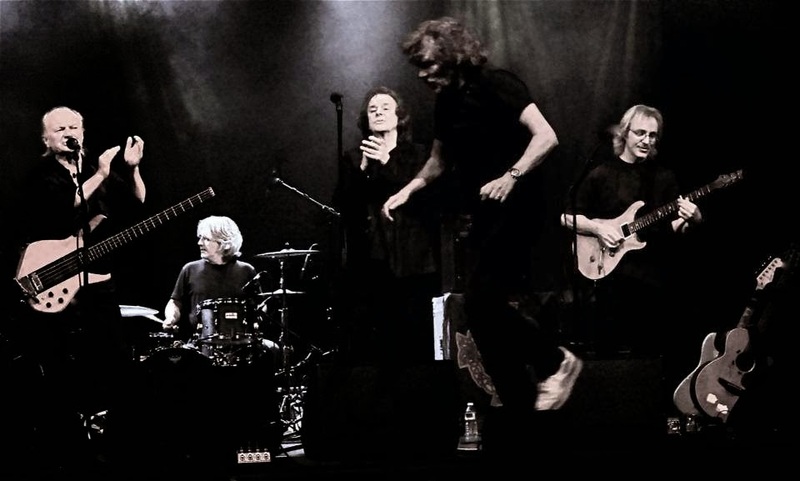 No wonder founding members Colin Blunstone and Rod Argent are still bringing The Zombies to appreciative audiences. Tale Of Two Literary Events. 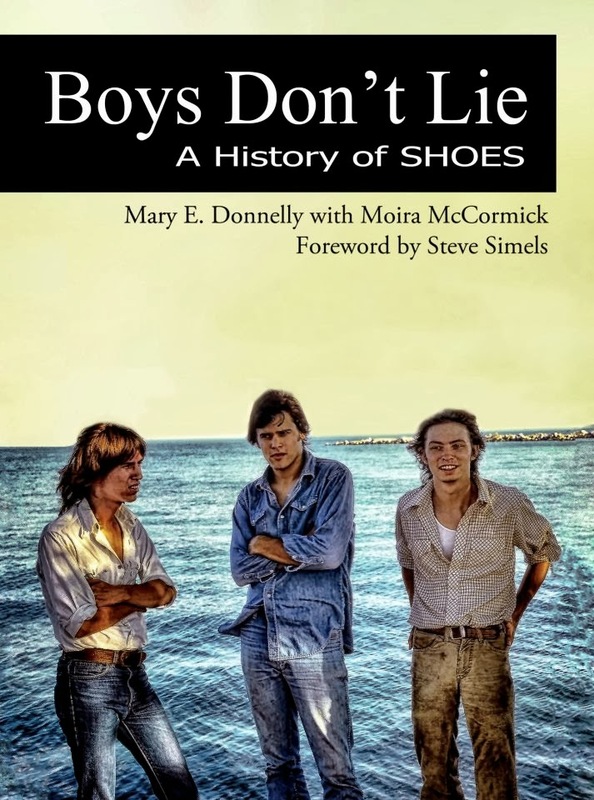 Authors Mary E. Donnelly and Moira McCormick will be in Chicago tomorrow night signing copies of their new book, Boys Don’t Lie: A History Of Shoes at The Book Cellar on Lincoln Avenue. My two-part review of this engaging bio of the Zion, Illinois based power pop band was posted on BHT earlier this week. This coming Monday, the writers group I’ve belonged to over the centuries is staging its Four Minutes Of Fame: A Stand-up Literary Event at the Tokio Pub in Schaumburg. I’ll be reading a chapter from my rock and roll novel, Finding Manchester, and other writers will be presenting their work. Please see yesterday’s post for a full profile on this event. How Much Is That Floyd Guy In The Window? It’s not often you see a huge poster of Syd Barrett hanging in the window of a department store on Chicago’s Magnificent Mile, but the Pink Floyd eccentric is the cover boy for fashion designer John Varvatos’ new book, Rock In Fashion. The shot was taken by noted photographer Mick Rock, who’ll be joining Varvatos and ZZ Top for a book launch and discussion at Nordstrom’s Michigan Avenue location on October 22nd from 6:00 to 7:30 PM. This Is This Guy On His Own. John Petitt, vocalist and guitarist with local band This Is This, has recorded a solo version of his “Sorry Don’t” and posted it to SoundCloud. The soulful rock tune originally appeared on the band’s The Hours, The Minutes And The Days CD. Well, How Did It Get Here? Anyone who’s ever wondered what a Brit free paper looks like (sort of their version of The Reader or Illinois Entertainer) can find one at the Reckless Records downtown location. Beat is a large format, London-based publication stuffed with eye-popping full-page photos and profiles of indie rock acts. Hip hop artist M.I.A. is the cover story for the Autumn 2013 issue. The Dawn Of Digital. Guitarist-singer James Moeller and singer Carla Hayden of whitewolfsonicpricess, an alt rock band with a theatrical bent, have announced that their 10 + 1 album is now available in digital format on their bandcamp page. Whitewolfsonicprincess also has a Live At St. Luke’s 5-song digital release for sale. Twigs TV. Fraternal twins Laura and Linda Good of The Twigs have created a light-hearted video that’s a perfect fit for “Baby, Don’t Cry,” from their recent children’s CD, Jump Right In. Dot Dot Dot: Don’t Do It. The popular co-ed synth rock band Dot Dot Dot has a gig scheduled for October 26th at the H.O.M.E. Bar in Arlington Heights, and it looks like this is going to be their last. This is reportedly due to the departure of founding member, guitarist Rose, who’s moving to the West Coast. If that’s the only reason, (I don’t have all the info on this) at the risk of seeming callous, I’d like to ask the remaining band members to reconsider. First, I doubt Rose wants the band to implode. Second, I know your fans want you to stick around. Third, you’ve all worked too hard to build a reputation as one of the area’s best festival bands to just walk away. Plus, with modern technology, there are ways Rose could still record music with you. Several bands over the years have survived the departure of a key member and continued to thrive. Heck, when I quit my comedy group Famous In The Future after 20 years, they threw a party. Not really, but they did move on and they continue to create funny skits and songs. That doesn’t diminish the role I played I previously, any more than Rose would be slighted if Dot Dot Dot went on without her. So take some time off, but give some serious thought to coming back again. Hopefully, there will be more Slumgullion later today or tomorrow. Here are a few things that are going on in the Chicago area tonight. Women In The Illustrator’s Chair. 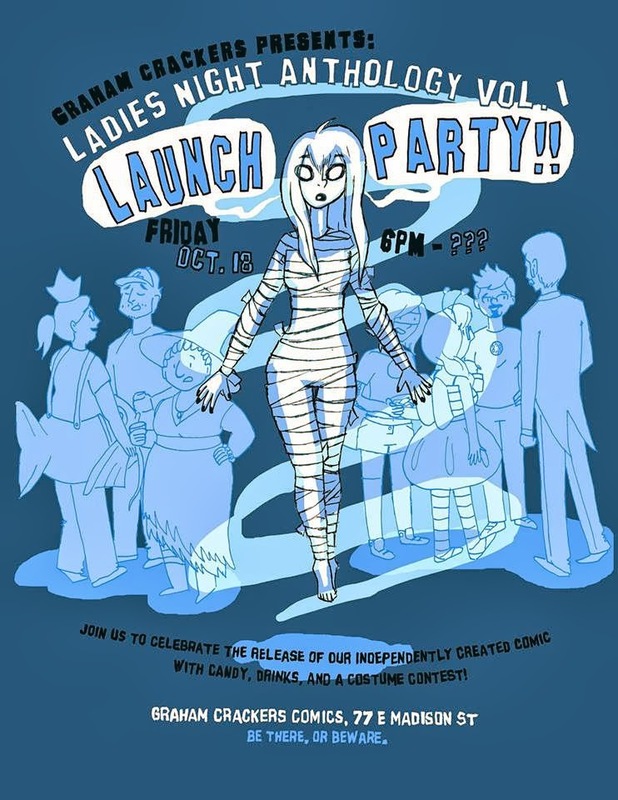 The Graham Crackers Comic Books store on Madison in downtown Chicago is presenting the Ladies Night Anthology Vol. 1 Spooky Launch Party tonight. The 60-page debut was created by local women comic artists over the past year, and will be available for $9.99. 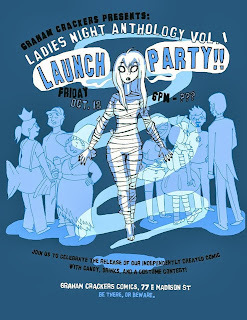 The Launch Party will include snacks and candy; costumes are encouraged. The Vic Theatre Has Got It Going On. There will be a wealth of power pop and alt rock tonight when Fountains Of Wayne, Soul Asylum, and former Lemonheads lead vocalist Evan Dando perform at The Vic. The music starts at 8:00 PM. Someone Is Still Making Unusual Pop Music. Meanwhile, Someone Still Loves You Boris Yeltsin, who are every bit as quirky (but fun) as their name suggests, have a gig at Subterranean. The band will probably be playing tunes from its latest album, Fly By Wire. A Great Big Pile Of Leaves (talk about quirky names) and The Damn Choir are also on the bill. Doors open at 8:30. Photo by Scott Beale/Laughing Squid, via Flickr. The writers group I’ve been part of for 11 years is hosting Four Minutes of Fame - A Stand-up Literary Event next Monday night at the Tokio Pub. Organized by Kym Brunner, Cherie Colyer, and Katie Sparks, it will feature authors sharing excerpts, book trailers, and illustrations. Tokio Pub, located at 1900 W. Higgins Road in Schaumburg, offers an Asian-inspired menu, but guests are not required to have dinner to attend this event. Admission is free. 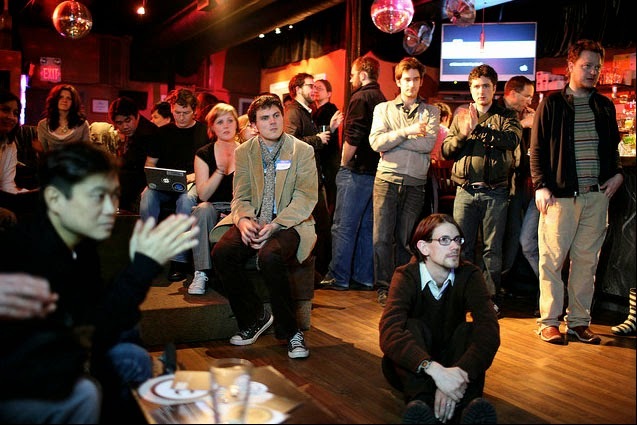 True to its title, the get-together will give each participant a four-minute time slot to showcase his or her work. Brunner will provide a preview of her Young Adult novel Wanted: Dead Or In Love, an imaginative tale of a teenage girl and her new beau who tangle with the spirits of Bonnie and Clyde in a most unusual fashion. Wanted: Dead Or In Love is due out in 2014, as is another Brunner-penned effort, a very funny Young Adult novel tentatively titled One Smart Cookie. Colyer will read from her Young Adult/Paranormal novel, Hold Tight; the second installment in her Embrace series, which centers on a bewitching and resourceful teenager named Madison. Sparks will read from one of her latest projects. Patricia Kummer will unveil her latest Middle Grade work-in-progress; and Veronica Rundell will introduce the audience to her emotionally charged coming-of-age teen novel, Imperfect. Picture book authors Lori Degman and Patrick Waldron will also be on hand. I’ll present a chapter from Finding Manchester, a comedy/suspense novel set in Chicago’s alt rock scene in the mid-1980s. Other members of our writers group are likely to participate, but at this point none are confirmed. Brunner, Colyer, and Sparks are literary event veterans, and their advice for the writers who’ll be reading their work before a live audience for the first time is basically to just act naturally. If Four Minutes Of Fame: A Stand-up Literary Event goes well, the trio is open to staging more in the future. A running theme throughout Boys Don’t Lie: A History Of Shoes is how determined the band was in pursuing its own version of rock regardless of what was currently popular on the Top 40. 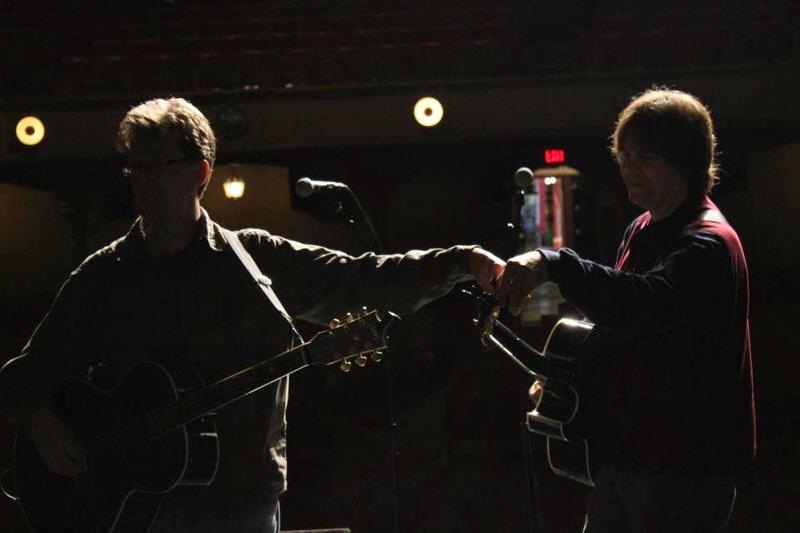 It’s also noted that the Murphy brothers and Gary Klebe have never been totally comfortable with the power pop label; they drew inspiration from The Beatles and more recent bands like Big Star, Cheap Trick, and the Dwight Twilley Band. Given that obsession with their own vision for making music, it was perhaps inevitable that Shoes would be at odds with noted producer Mike Stone when it came to recording Present Tense for Elektra at The Manor Studio in London. But while those squabbles could be chalked up to creative differences, it was harder for Shoes to comprehend the label’s logic regarding distribution and promotion. Despite including classic tunes like “Too Late” and “Tomorrow Night,” Shoes’ major label debut notched disappointing sales. It was a case of missed opportunities, but the band members took heart in Elektra’s promise that things would be better for the next album. With harder-edged, melodic songs like “Your Imagination” and “She Satisfies,” Tongue Twister did seem destined for the top of the charts. Anyone unfamiliar with the story of Shoes would probably assume while reading Donnelly’s account of the band working with producer Richard Dashut of Fleetwood Mac fame in Los Angeles, that a major commercial breakthrough was imminent. But Tongue Twister proved to be more heartbreaking for Shoes than its predecessor. Once again, Elecktra’s decisions, particularly refusing to bankroll rock videos for songs from Tongue Twister even though MTV was urgently requesting them, seemed hard to fathom. When Boomerang, the next LP was given virtually no label assistance at all, Shoes were acutely aware that their days at Elektra were over. As any loyal Shoes fan attest, the band wasted no time in proceeding on its own. 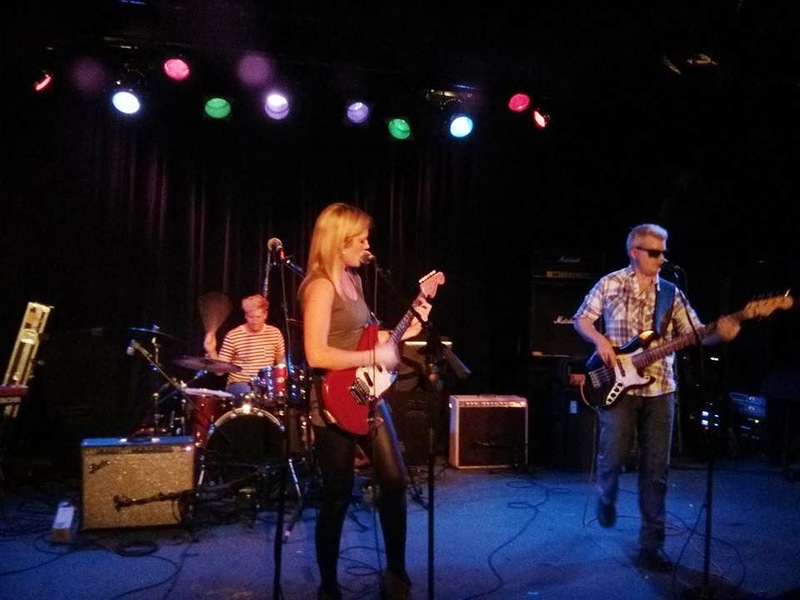 Donnelly chronicles how Shoes upgraded their recording studio, Short Order Recorder, learned the ropes of distribution, and began producing other Chicago area bands as well releasing their own albums. They would quickly adapt to the new CD technology. Shoes and their Black Vinyl label had a good run but eventually the economy would force them to sell their studio. Although it looked like they would never record again, most of the music created by Shoes lived on via the Internet. Donnelly could not have known when she first approached Shoes about doing this book that they would regroup and record the critically acclaimed Ignition in 2012. It makes for a happy Epilogue. It’s also a kick for those of us in the Chicago area to read a book that mentions so many of our local musical heroes, from the bigger names like Cheap Trick and Material Issue, to lesser known but still worthy acts like Herb Eimerman (who performed in The Nerk Twins with Jeff Murphy), 92 Degrees, Swingset Police, Fun With Atoms, and Kelley Ryan. In Our Lives . . .